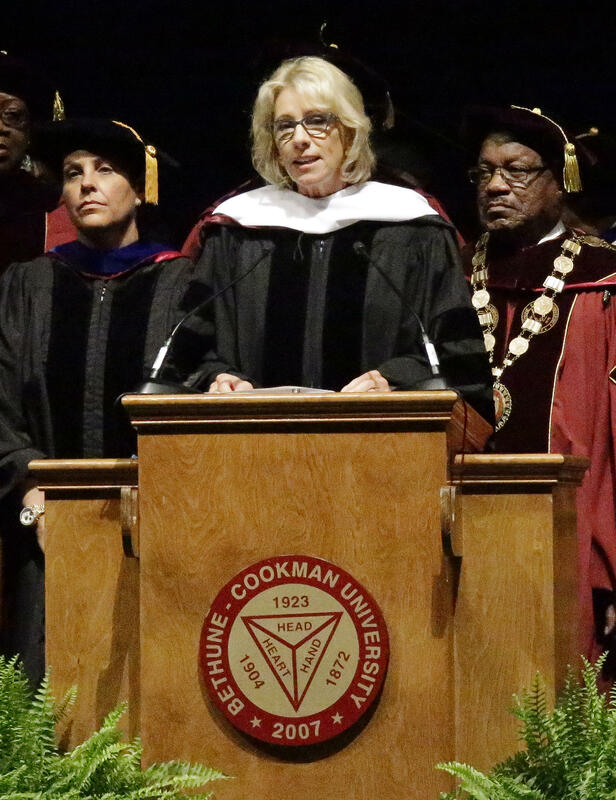 In a speech delivered amid constant streams of boos and chants, Secretary of Education Betsy DeVos addressed the graduates of historically black institution Bethune-Cookman University in Daytona Beach, Florida on Wednesday. DeVos was able to finish her speech but not without being forced to pause as outraged students shouted and audibly booed her comments. School president Dr. Edison O. Jackson threatened to end the commencement ceremony at one point, suggesting he would mail students their degrees instead. "Choose which way you're going to go," he told students, as boos grew louder. Much of DeVos' speech was devoted to embracing student's differences and encouraging graduates to pursue careers in service and "embrace grace." Omarosa Manigault, a political aide to Mr. Trump was also present at the graduation ceremony, and like DeVos, was jeered by the audience when introduced by the school's president. "You don't know her and you don't know her story" Jackson said in defense of Manigault. Students and members of the alumni community at Bethune-Cookman University had signed a petition, calling for DeVos to be removed from the roster of speakers at the commencement ceremony. Students reportedly planned to protest the day's proceedings and delivered over 50,000 signatures to Bethune administrator's offices. DeVos had previously come under fire for her comments regarding HBCUs, calling the colleges "real pioneers when it comes to school choice." "They are living proof that when more options are provided to students, they are afforded greater access and greater quality," DeVos continued. Critics were quick to point out that HBCUs were created because African American students were denied access to higher education. DeVos later amended her comments in a series of tweets the next day, reflecting the importance of the institutions. #HBCUs are such an important piece of the fabric of American history—one that encompasses some of our nation's greatest citizens. Recently, Mr. Trump had declared his "unwavering" support for historically black colleges and universities. See our live blog of the commencement proceedings from earlier below. 1:22 p.m. DeVos completes her speech as students fall silent, administrators applaud the secretary. 1:19 p.m. "We should embrace the change to grow and to serve, we should pursue these opportunities with humility and grace," says DeVos in the closing of her speech. "Approach the unexpected and unforeseen with grace. DeVos says the startling polarization across the United States is visible on social media and news networks. "We will not solve the significant problems our country faces if we can not bring ourselves to embrace a mindset of grace," says DeVos. 1:17 p.m. "Our nation has made remarkable progress, but addressing inequities remains a challenge," DeVos tells students. "America is too great a country to deny any child this equal opportunity," she adds. 1:14 pm. DeVos acknowledges students who are the first in their family to graduate. The first round of applause for the Secretary, DeVos acknowledges a student who was the victim of gun violence who will receive his degree today. 1:09 p.m. DeVos recalls the history of Bethune's founder, civil rights activist Dr. Mary McLeod Bethune, saying that Bethune "refused to accept systemic racism,"
Loud boos erupt as DeVos announces plans to pay her respects at Dr. Bethune's gravesite. 1:08 p.m. Now surrounded by school administrators, DeVos advises students to give back to their community as boos still persist. 1:03 p.m. DeVos attempts to re-take the stage, boos continue to drown her out as she promises to continue the work in preserving HCBU'. DeVos shifts her speech to embracing differences from others, saying she is here "to celebrate you and all of your achievements and to encourage each of you to reach your full potential." DeVos says the Trump administration is committed to students' success across the country. 1:00 p.m. Amid loud boos and chants, DeVos tells the crowd "thank you for the invitation for me to be here" adding "a hallmark of higher education is ability to converse with and learn from those with who we disagree." School president Jackson threatens to end graduation and mail degrees to student "choose which way you're going to go," he says. 12:45 p.m. In an uncomfortable introduction to her remarks, boos and shouts erupt as DeVos takes the stage. Mentions of Mr. Trump illicit the loudest of boos from students. 12:30 p.m. Omarosa Manigault, a political aide to Mr. Trump is present at the graduation ceremony, and received a round of audible boos from the audience when introduced by the school's president. "You don't know her and you don't know her story," said Bethune-Cookman's president Dr. Edison O. Jackson in response to the disruption. 12:00 p.m. The commencement begins and students start to file in to hear Secretary of Education Betsy DeVos' address.